Astronomy is a wonderful way for children to discover space, so if you want to buy your child an amazing gift that they can cherish for a long time, you might want to consider a telescope. When it comes to finding the best telescope for kids, the mission can prove to be more difficult than expected. Before going on the hunt for the best telescope for kids, you should know that there are three types of telescopes: refractor telescopes, reflector telescopes, and compound telescopes. Below, we have dedicated an entire article to helping you find the best telescope for kids in 2018. Check out these popular and quality options for children below. 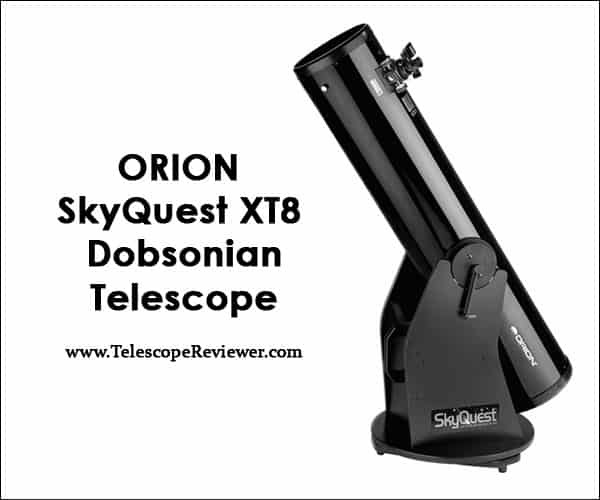 The Orion SkyQuest XT8 Telescope is one of the most praised models online. It is a reflector telescope. Around 75% of customers currently rate it with 5 stars. Out of over 170 reviews, almost all of them are positive, and customers honestly recommend the Orion SkyQuest XT8 Telescope as a good telescope for kids. It is very inexpensive for the value it offers, and it also comes with free shipping on Amazon. The large aperture will help your child discover breathtaking nebulae and galaxies. In addition, the reflector optics with an 8-inch diameter will aid them in observing planets. This is a great Dobsonian the entire family can enjoy, and that will last for years. If you purchase the Orion SkyQuest XT8 Telescope on Amazon, you will also receive several accessories. That includes a 25mm eyepiece (Sirius Plossl), a 2-inch focuser (Crayford – works with 2-inch and 1.25-inch eyepieces), a cap for collimation, an EZ Finder II, and specialized software. Therefore, you can get some extra guidance for star gazing. Customers note that this telescope is very easy to assemble, and even easier to use, so you can understand why it could be the best telescope for kids. If you are looking for cheap telescopes for children that still offer an amazing experience, the Orion SkyQuest XT8 Telescope has to be at the top of the list. Take your family on camping trips and introduce your children to observing celestial objects with this telescope. 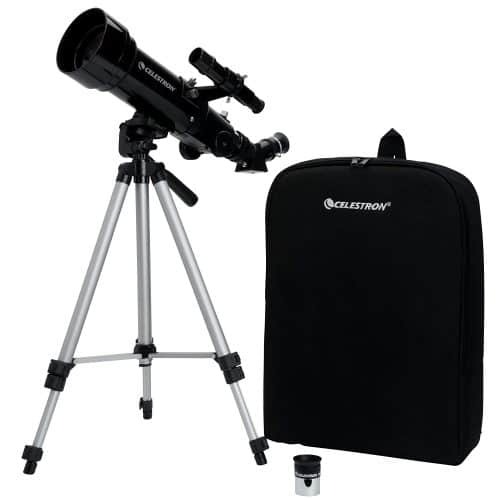 Celestron has designed the Celestron 21035 70mm Travel Scope as one of the best telescopes for kids, and as a fantastic way to introduce education on vacations. The Celestron 21035 70mm Travel Telescope for kids can be your next reason to spend more time with the family in the great outdoors. If you look into the Travel Scope on Amazon, you will instantly notice that it is a #1 best-selling refracting telescope. 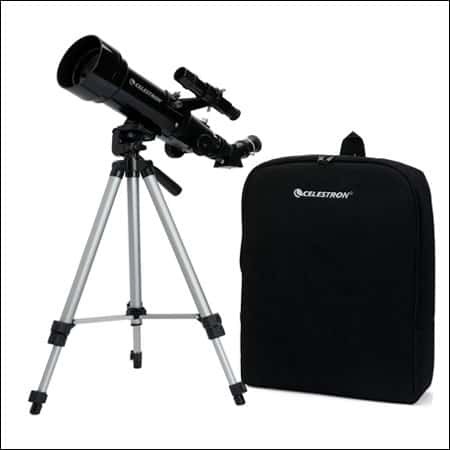 The refractor comes with a custom-made backpack, and it only weighs 3.3 pounds, for light traveling. Its portable features make it a great telescope for kids. The package comes with both low and high power eyepieces, as well as astronomy software. You can also use the Celestron 21035 70mm Travel Scope for some jaw-dropping images through astrophotography. We truly recommend this for families who are looking to spend an authentic adventure with their kids. Why not teach your child how to observe both the day and night skies? The Meade Instruments 209002 Infinity 60 AZ Refractor Telescope is ideal for this situation. It’s clearly the best telescope for kids according to multiple users. It can offer your child quality, fun, and interactive education throughout the day. You can try activities such as observing the sea or doing some bird-watching during the day, and then move on to discovering the stars and planets at night. 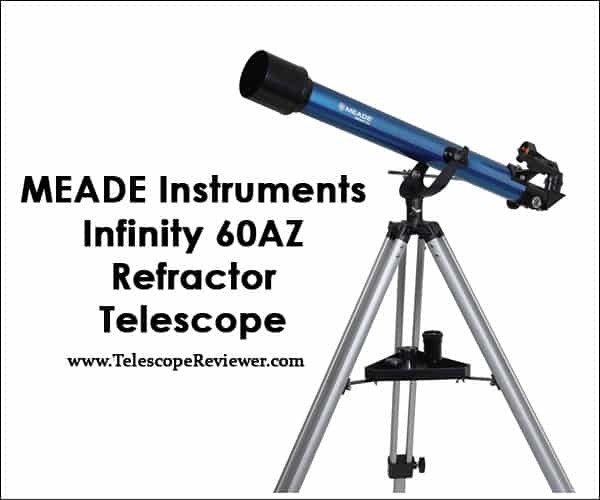 The Meade Instruments Infinity Telescope is currently available on Amazon. It has a 2.4-inch aperture (60mm), and a focal length of 800mm. You get two eyepieces with your package for different types of viewing: a low magnification eyepiece at 26mm and a high magnification eyepiece at 9mm. Additionally, it comes with a 2x Barlow lens that can double the power of magnification for either of these two eyepieces. It’s a good telescope for kids who want to satisfy their curious minds. One of the best perks of this telescope is that it is a refracting instrument. Therefore, you do not have to spend time and energy collimating it (a process also known as alignment). All you have to do is unpack the scope, assemble it, and start learning. Its easy functionality makes it a strong contender to the title of best telescope for kids. Customer reviews show that the assembly is very simple. In fact, the only step that might take a bit of time and experience is focusing the red dot viewfinder. Regardless of that, it’s an excellent kid’s telescope that won’t cause any confusion upon setting. This is a reflector telescope. It’s no wonder that Celestron named this model the FirstScope. It’s one of the most promising telescopes for kids and adult beginners alike. In our Celestron FirstScope Telescope review, we explained that this 2009 model received several awards. In addition, it’s highly appreciated by all customers across the United States, not just as a kids telescope. Almost half of the reviews on Amazon offer the Celestron FirstScope Telescope positive feedback. Customers state that they are highly pleased with their purchase. Given customer feedback, it’s clearly one of the best-selling scopes in its class. The product itself is quite affordable, and also benefits from free shipping on Amazon. The main tube can be moved, so you can easily navigate. The package also includes two eyepieces. The FirstScope is very lightweight (only 4.5 pounds), and is 9 inches long, 9 inches wide, and 16 inches tall. The reflector optical tube has a 76mm aperture. Its ease of use makes it one of the best choices for kids. The FirstScope, a reflecting Newtonian telescope, was inspired by Galileo Galilei. It can also serve as an intriguing history lesson for your kids. Just like the Travel Scope, the Celestron FirstScope Telescope is an excellent choice when traveling to remote areas. Pack up your scope, gather the family, and take a drive towards an unforgettable experience. It is a perfect choice when you know you’ll have an open field with a broad view to observe. One of the greatest issues that come up when looking for the best telescope for kids is that telescopes usually take up a lot of space. We already know how difficult observing can be in urban areas, especially in those with light or air pollution. Sometimes, we have to travel to some areas where there are as little buildings, lights, and all-around pollution as possible just to enjoy the night skies. 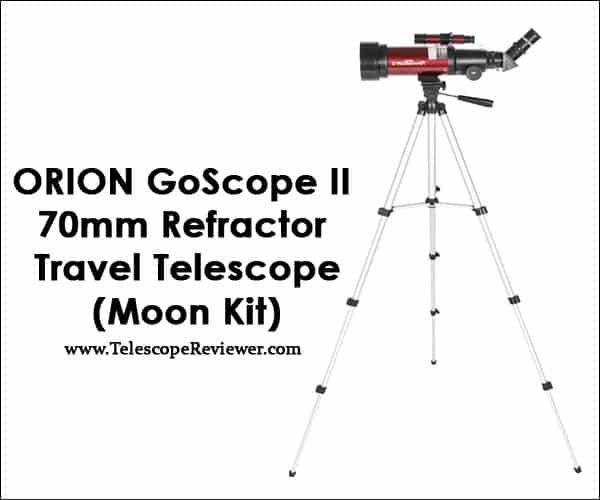 This is where the Orion 10034 GoScope II 70mm Refractor Travel Telescope Moon Kit comes in. It’s a good kid’s telescope that will fit comfortably in their room or in the car. This compact, portable, and trusted telescope is precisely what you need to create a family vacation to remember. 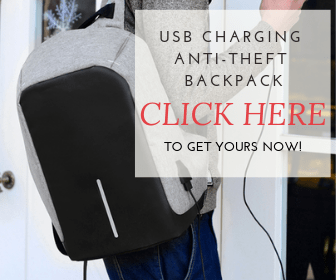 You will be thrilled to see how easily it can fit into the trunk of your car, especially thanks to its useful backpack. It only weighs 3.5 pounds, and is 14.5 inches long, 11 inches wide, and 20 inches tall. The scope is one of the top best-selling refracting telescopes on Amazon, partly owing to its accessible price tag. It is designed and manufactured by Orion, one of the most respected companies in the telescope industry. Therefore, it’s a perfect telescope for kids that’s both affordable and high-quality. In the package, you also get a finder scope (5 by 24), one 25mm eyepiece (for 16-power magnification), and a 10mm eyepiece (for 40-power magnification). In addition, it comes with free shipping for your package, and a free Orion Moon Map 260 (valued at $13), so you have all the reasons to purchase it as the first telescope for your kids and, why not, for the entire family. 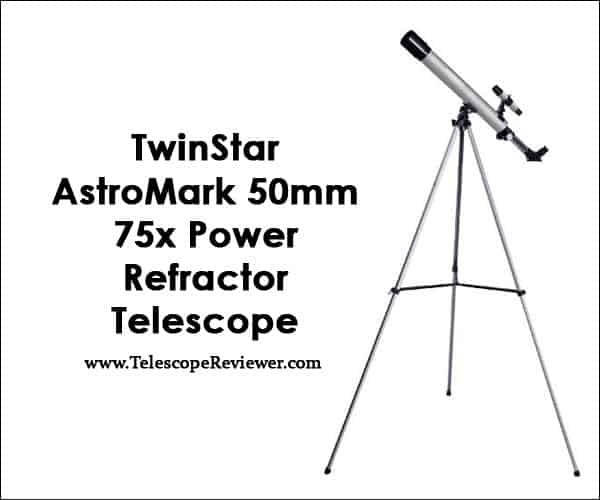 The TwinStar AstroMark 50mm 75x Power Refractor Telescope is one of the best telescopes for your kid. One of its advantages is that it is very easy to set up and use. All you have to do is point and shoot to get some amazing images. The TwinStar telescope has an achromatic objective lens (50mm), a focal length of 600mm, and it comes with a wide range of goodies. That includes a tripod (full size), Altazimuth mount, a 30x magnification eyepiece (H20mm), and a 48x magnification eyepiece (H12.5mm). Both eyepieces have a diameter of .965 inches. In addition, this kid’s telescope offers access to an online guide for assembly that takes you through all of the necessary steps. Amazon customers state that it is an excellent gift idea for children. Most importantly, you get a decent value for the price you pay. Please keep in mind that this is a telescope for beginners, and a telescope for kids in particular. Therefore, do not expect to get a top-notch professional telescope. It is the best telescope for kids around age 10, according to many users, so keep that in mind while you’re deciding. As we explained in our Celestron 21041 60mm PowerSeeker Telescope review, it’s hard to find a telescope that can fit into a tight budget and offer great value. 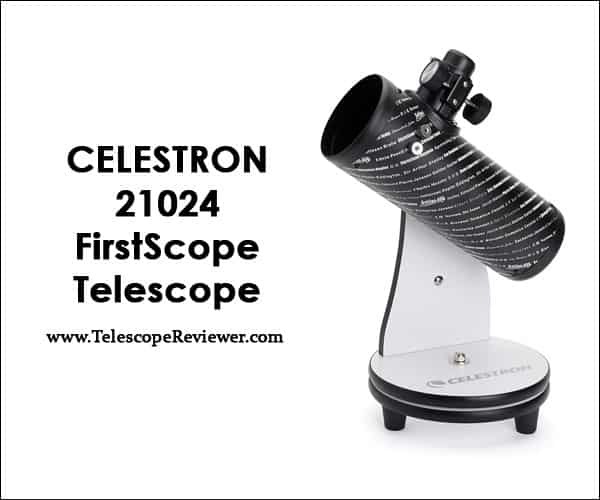 Celestron 21041 is exceptional from this point of view, and excellent as a kid’s telescope. It is one of the most celebrated and praised telescopes for kids and beginners on the market. 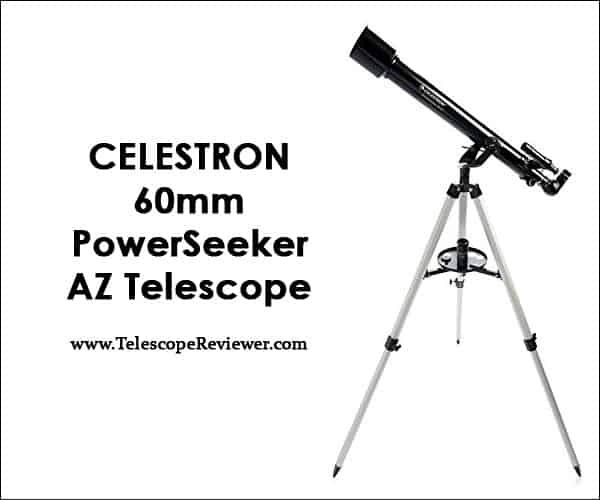 The Celestron 21041 60mm PowerSeeker Telescope is a delightful choice if you want to benefit from a quality product that is worth your money. It’s a refractor telescope, which means that it is simple to set up and use. That’s yet another reason why it’s a strong contender to the title of best telescope for kids. One of the perks of buying this telescope on Amazon is that it comes along with a 3X Barlow lens. That takes the magnification of each eyepiece and triples the power. Your order also comes with an astronomy software and two eyepieces (4mm and 20mm). You can use it to observe both terrestrial and celestial objects, so you get the best of both worlds. It’s one of the best telescopes for kids who want to explore everything around them. At the moment, the majority of customer reviews recommend this scope for beginners. It can help one ease into the world of astronomy at a nice pace. It might just be the best first telescope for kids due to the effortless access. One of the greatest advantages that this scope has is that you get an abundance of accessories by ordering it. Most telescopes usually come with the instrument itself, and an eyepiece or two. This is a lovely opportunity to save money and get a good telescope for your kid. We hope this search for the best telescope for kids had helped you find an appropriate telescope for your kid. Remember that, in the end, you should make star gazing an entertaining and informative activity. The best telescope for kids will help you do just that. Never forget to have fun and enjoy the quality time spent with your little one. You can also consult our complete guide on How to Use a Telescope for detailed instructions for different types of scopes. It’s a great informative article indeed. I have a little interest in astronomical works and I always wish that if I could be an astronaut. We all dreams never come true always. From this article, I learn much information about a rotating multiple mirror telescope. I appreciate the effort you took to share it with us. Hope, will get more from you soon.